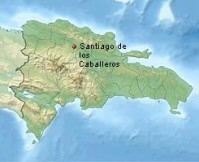 Santiago de los Caballeros is the second largest city with approx. 1 million citizens. 1494 Christopher Columbus ordered to build a fort next to the Rio Yaque river, later then it developed to the big city of Santiago de los Caballeros. A few old ruins still exist in the village of Jaragua located approx. 7 km from Santiago. 1562 Santiago was totally destroyed by a earthquake and rebuild where it is located today. The culture of tobacco and sugar cane made Santiago fast to a very important economy center. The monument (foto above), built by Trujillo, is today the sight seeing of the city.